An octothorpe in the post title can only mean one thing: It's time for yet another edition of the Grab Bag of miscellaneous highsec miner tears! True story, before the New Order introduced evil to it, the internet was a clean, family-friendly place. Long-time malcontent SPIONKOP draws a line in the sand. He doesn't specify which side represents evil, though. 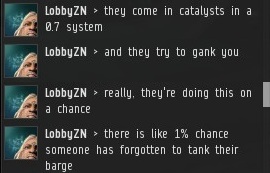 The New Order is surprisingly adept at finding the 1% of miners who "forgot" to tank their barge. The Reaper J has finally had enough. 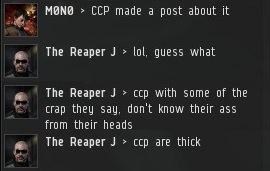 But will CCP give in to his demands to ban the gankers? 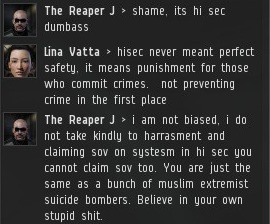 CCP always goes from hero to zero in the minds of carebears, once they learn it's not against the EULA to shoot spaceships in highsec. 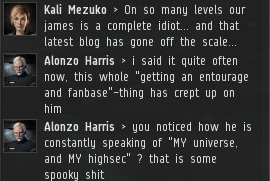 Why does it continue to bother so many people that we claim highsec? It's just like NPC null or lowsec. Concord squads roam highsec, true, but so do our Knights. Think outside the box. 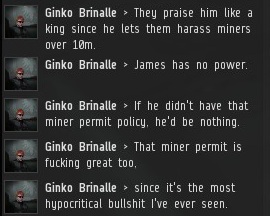 Ginko Brinalle says that I would be powerless, if not for the miner permit policy. Thank goodness for the Code! 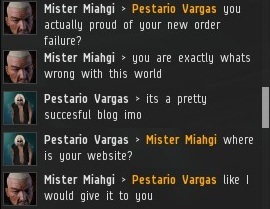 Agent Wescro2 received a nastigram from a miner who questions our capitalist credentials. To be fair, I never claimed the New Order regime was capitalist, only that it was democratic. In recent days, miners are beginning to concede that some aspects of the Code are good and just. But they feel that the Code, and that I, have become corrupted by power. Whoever said power tends to corrupt never met me. I'm a man of the people, always. Pods were made to be popped. How can that be griefing? I'm beginning to suspect the carebears have a poor vocabulary: They always confuse "griefing" and "fun". A Knight is someone who is committed to completing the mission, no matter what the price. Of course they would suicide gank. It's the purest expression of dedication that I can think of. Also, honour. There are actually several anti-Order blogs out there, but they usually have short life spans. MinerBumping enjoys the advantage of being timeless. Inspektor Cluseau levied a baffling charge against me. 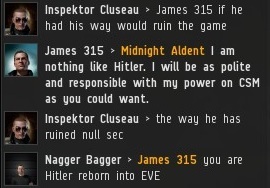 When did I ever ruin nullsec? 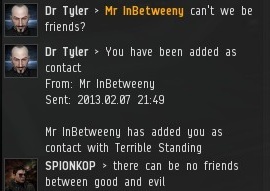 Then I remembered that Inspektor thinks I am the leader of the Goons and/or TEST. 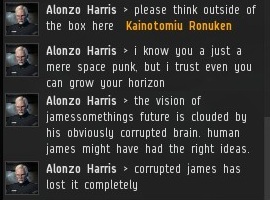 Now I just wonder when Goons and TEST ruined nullsec. These poor miners... They seem to think that popping people 'shitless' is okay, but that if they get popped once, it's harassment. This sort of confusion is exactly why the Code encourages us to dispense salvation in the form of antimatter salvos. 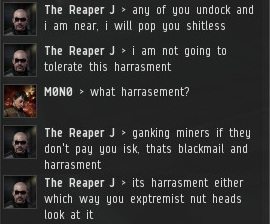 personally, i love miners who ACTUALLY respond. it means that all the effort the NO puts into removing botters enlightens the semi-afk or afk miners keeping them at their computers WHILE they mine, AS they spew their tired rhetoric about how bad the New Order is. 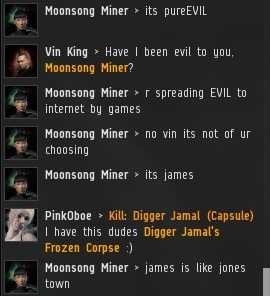 MINING WHILE AT THEIR KEYBOARDS. huzzah to the New Order, to miners at their keyboards, and ALL eve pilots! "A Knight is someone who is committed to completing the mission, no matter what the price. Of course they would suicide gank. It's the purest expression of dedication that I can think of. Also, honour." There is so much on that page that seems appropriate for the New Order and head in the sand miners but I would like to paste just one ( translated ) quote from that page. "It is very important to give advice to a man to help him mend his ways. It is a compassionate and important duty. However, it is extremely difficult to comprehend how this advice should be given." Doesn't that just sum the New Order's purpose up perfectly? Knights are superior to Kamikazes. A Knight of the New Order can give his life for the cause several times in a single evening if needed. Clone replacement is cheap and easy. Today is a good day to die. Join us. I wonder how can people defend the players depicted here... Those raging miners are close-minded, vulgar, stubborn and violent, and yet people think they're innocent victims. They think that by AFK mining they're providing minerals to build things, without noticing that they're actually harming legit miners that mine only at the keyboard by devaluing minerals price. They rage when they find out that their AFK ship has been bumped or destroyed, like it was a given right to not be destroyed even when they're not there to defend themselves. They lose pixels in a game and they react like they have been beaten in real life, they can't understand the rules of the game and yet they insult and judge others. I suppose they react the same way when they have to pay rent to other players in Monopoly. These kind of players makes me feel sick. What is the Role of the CSM?